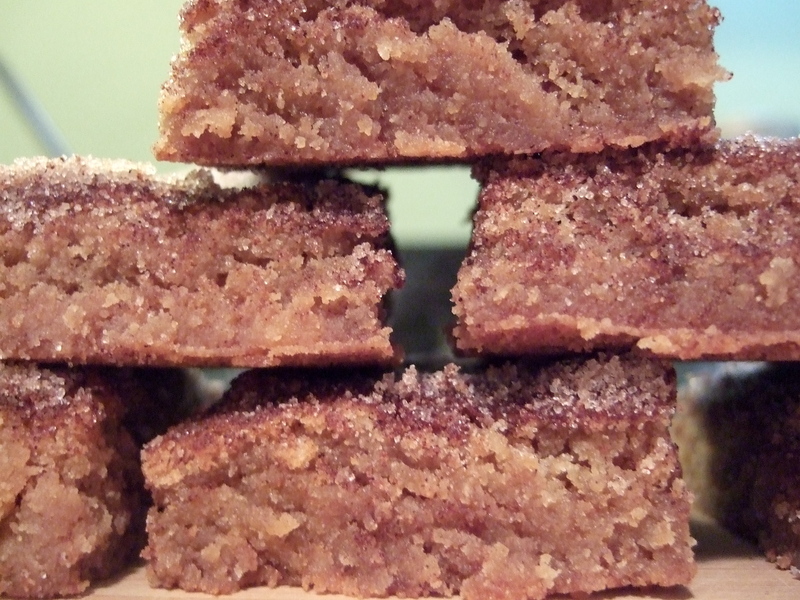 Snickerdoodles have always been one of my favorite cookies, so when I was pondering ideas for brownies and bars, these naturally came to mind. They’ve got all the deliciousness of the original, but you don’t have to roll all of the little balls of dough in the cinnamon sugar mixture. So hard, I know. I’ve actually made these twice this month. The first time was at the beginning of the month, for a shelter dinner. I forgot, however, to take pictures before I handed them over, so knew I was destined to make them again. Yesterday while running errands, I realized that I was getting into a rut of baking mostly on Sundays, so the same people (two sets of coworkers) were always getting the results on Mondays. Basically, the midweek and weekend crews were getting shafted. By the time we got home (from the restaurant supply store, woohoo!! ), I had less than two hours to figure out what to make before I’d be leaving the house again. 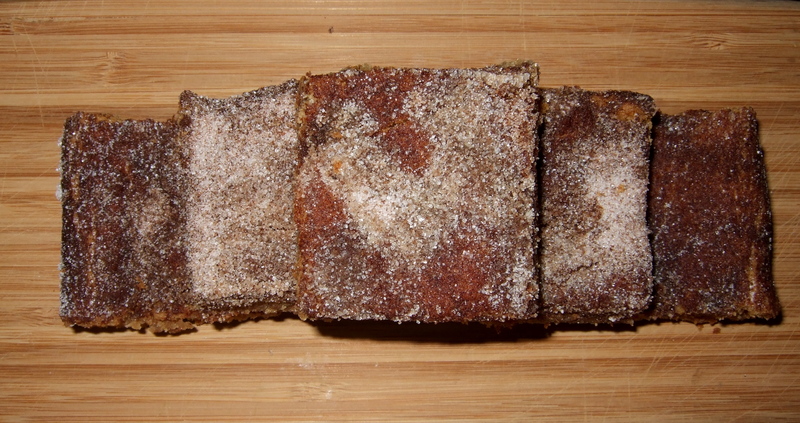 Snickerdoodle bars! Seriously, they are so easy it’s almost embarrassing. So I whipped up a batch, let them cool briefly before cutting, and then ran out the door. The Saturday tasters were delighted to be remembered, and all enjoyed the bars. They actually taste best when you let them sit for a day or two, so the flavors can really meld together, but they rarely last long enough for people to discover that. Read the rest of this entry ? Oh my stars, lemon bars! The minute I mentioned that February would be all about brownies and bars, requests were coming out of the woodwork for lemon bars. I must admit that up until now I’ve had maybe two in my life. And maybe those weren’t the best in show, but I’ve just never been really impressed. 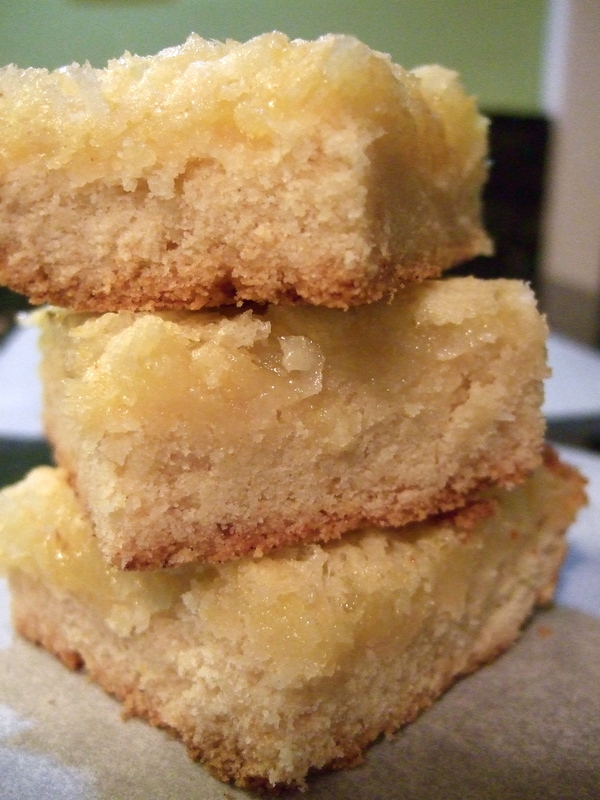 Not a major lemon bar groupie. It seems that I’m unusual in that respect. 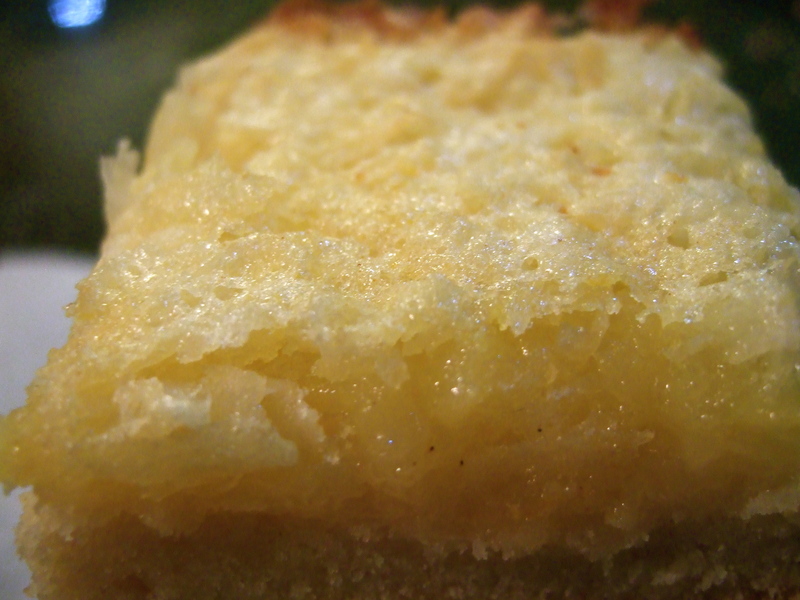 For most other people, at least within my peer group, lemon bars trigger shortness of breath, accelerated heart rate, and a quantity of drool that would make Pavlov jealous. So I figured what the heck, I’ll see what I can do. As I frequently do, I found a recipe to use as a jumping off point, and then I tweaked the living bejeebus out of it. For this particular treat, I completely discarded the suggested base layer, and replaced it with a variation on mrslovey’s favorite sugar cookie recipe. Then I added some coconut for texture (which was surprisingly awesome), and nearly tripled the amount of lemon called for in the original. How did they come out? Pretty freaking delicious. While I’ll probably try to up the lemon factor even more next time, for now these should keep the junkies at bay. Read the rest of this entry ? Tomorrow at work we’ve got a charity bake/candy/craft sale. Anyone who wants to can bring in items to donate, and then the entire floor can buy whatever piques their interest. All proceeds go to the American Heart Association. Yeah, I know, a little odd to promote cookies and candy to support healthy hearts, but I just viewed it as another opportunity to bake. I pulled out my newest friend, Pillsbury Best of the Bake-Off Cookies & Bars, and began to browse. Almost immediately (pg. 14, to be exact), I found exactly what I was looking for – Salted Peanut Chews. Not too complicated, and hopefully a little different from the brownies and cookies that are bound to be there. These were easy to make, although it was a little messy spreading the peanut mixture on top of the hot marshmallows. When it all cooled, however, it looked perfect. As part of my *ahem* ‘quality control program’ when making a recipe for the first time, I totally nabbed a piece to try. WOW. Completely amazing, don’t change a thing. It had some crispy crunchy, and some ooey gooey, some sweet and some salty. 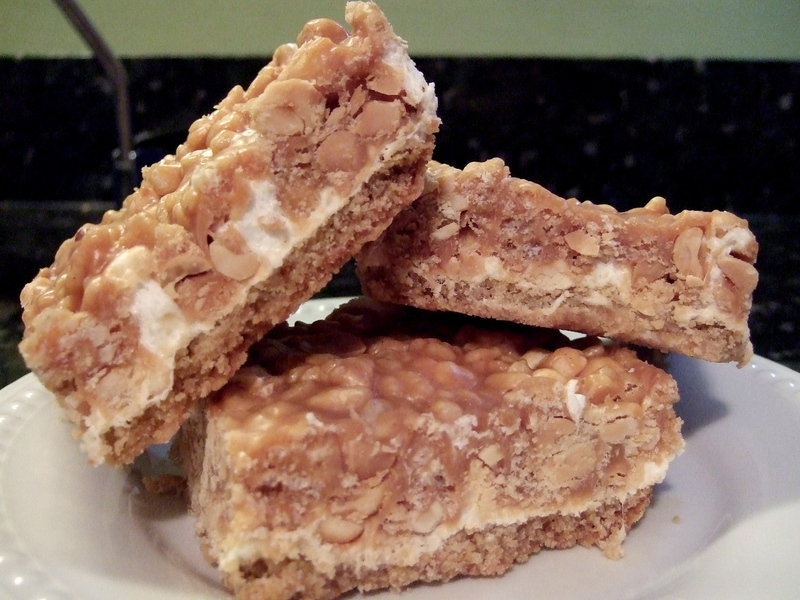 If a Payday bar and a Fluffernutter sandwich had an illegitimate love child, it would taste exactly like this. Yum. Read the rest of this entry ? Super Bowl Sunday in loveyland turned into a baking marathon. It started out with a loaf of bread, and all of a sudden it was six recipes and seven hours later. Almost as long as the game! I kid, I kid. I’ll be doling these out one at a time, like the tasty treats are. Each one deserves to be savored. First up, a taste of citrus. Maybe it was a mid-winter craving for sunshine, or a latent ancestral scurvy-avoiding instinct, but we needed some serious tartness. 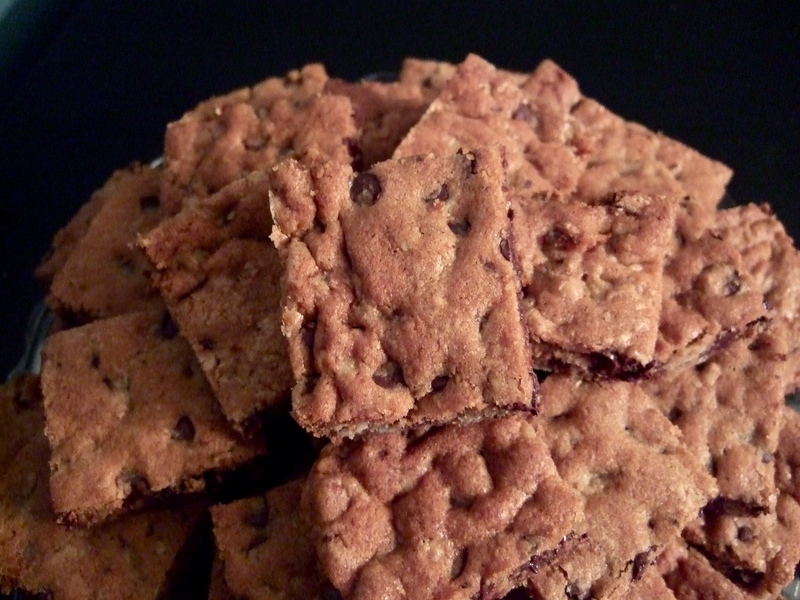 Happily, earlier in the week I discovered a cookbook devoted to cookies and bars that I had completely forgotten about. 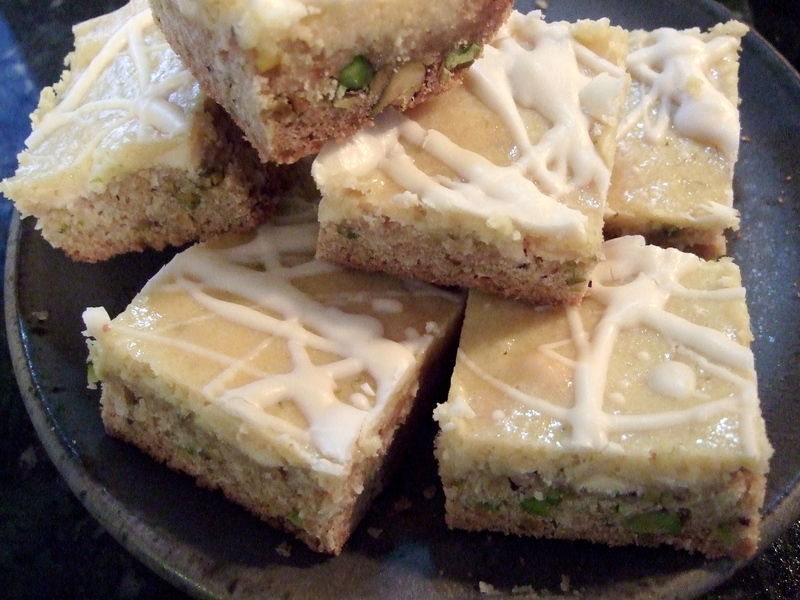 Browsing through led me to a promising recipe for lime bars, but I was not at all pleased at the suggestion to use refrigerated cookie dough for the base. “Not I!” said the little red hen! So I made my own base recipe, and then tweaked the heck out of the filling. By the time I was done, the original recipe was more of a suggestion than anything, and we were smacking our lips over some majorly tart lime delights. 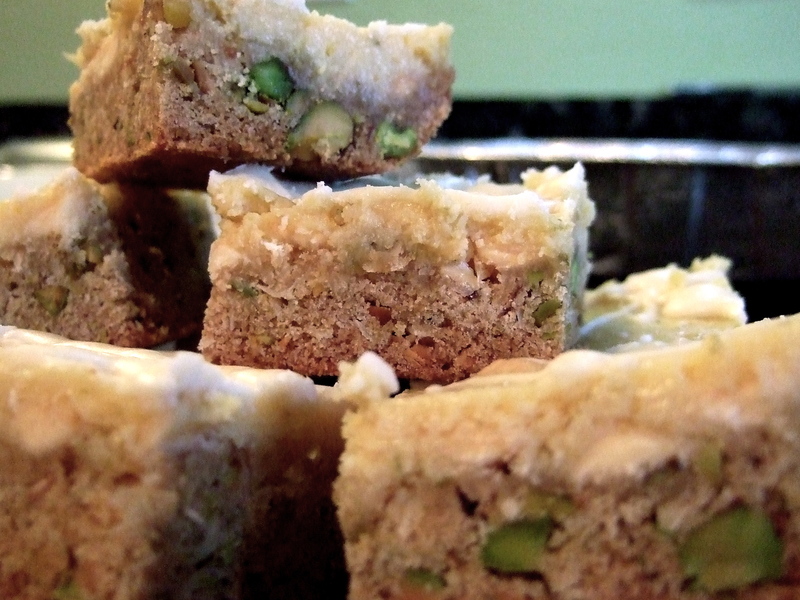 The white chocolate, pistachios, and coconut help to balance out the sourness without being overly distracting. Sunshine accomplished! Read the rest of this entry ? Absent-mindedly reading the back of the bag – a habit I’ve had as long as I’ve been reading (seriously, who can eat without something to read?) – it hit me between the eyes like a freaking sledgehammer. 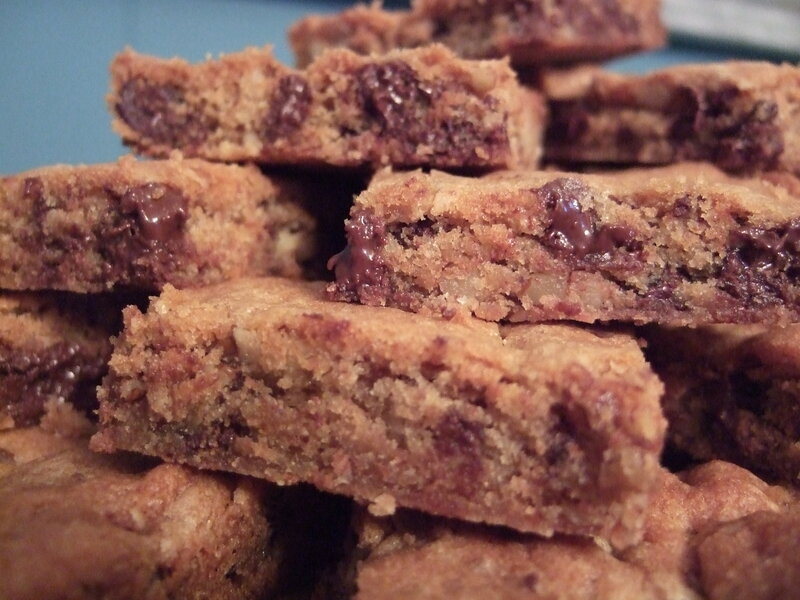 Toll House cookie BARS! Perfect solution when you need something reeeealllly easy and comfortable. We ended up eating a couple of them, just enough to get a taste, and then the next morning the rest went to mrslovey’s work, where they were devoured instantly. There’s a reason these are a classic. Read the rest of this entry ? I’m a hobbyist baker who gets rave reviews on my output – “you should do more with your baking! you have skills!” – so here I am, blogging as I experiment. We’ll see if more than 3 people read along. One reason for this project is to encourage me to bake more. Currently I’ll go through phases where I don’t bake for weeks on end, followed immediately by a weekend where I just MUST bake at least 700 things. I’m hoping this will even it out a bit. Due to a touch of (undiagnosed, unmedicated, but oh-so-there) ADD, I am sometimes paralyzed with all the different choices of what to make next. To that end, I’m going to attempt a different category each month, to help direct my efforts. Of course random things might still pop up, but I’ll try to keep to the month’s theme as much as possible. As time progresses I’ll be working on developing more of my own recipes, but to start it will mostly be one of the zillion recipes in my ‘to try’ file. Anything used that isn’t my own will be appropriately recognized. Anyway, thanks for popping in, hope you enjoy. If you see any glaring mistakes or stupidity, please feel free to (gently) let me know.